When taking care of orchids, it is important to diagnose problems and identify the best solutions as soon as possible. Prompt diagnosis of common orchid pests and diseases can increase the chances of effective treatment and plant survival. The best defense against common orchid pests and orchid diseases is constant vigilance and early detection. First and foremost, keep your growing area clean and free of dust and debris. Remove all dead leaves and flowers from the floor, and clean up any clutter, such as cardboard boxes and empty bags. If you notice that your orchid plants have been infected by some type of orchid pest or diseases, identify the problem, and deal with it as soon as possible. Remember, the quicker you deal with the problem, the better chance your orchid has of surviving. White cottony masses appear on leaves. Solution – Isolate the orchid and attempt to remove the mealybugs by hand, using a cotton swab dipped in alcohol. For preventive care, clean leaves periodically with a soft, damp cloth. Flowers develop small, brown, circular spots. Cause – A fungal disease called petal blight. Solution – Remove the flowers that are affected. Improving air circulation around the plant can prevent occurrence of this problem. Leaves show unusual crinkles and blotches – new growth is slow. Cause – Virus infection. Viruses can be spread by insects or by humans when plants are handled or repotted. Solution – Unfortunately, affected plants should be destroyed. Be sure to sterilize instruments (scissors, knives, etc.) used to repot plants. This can be done by dipping them in boiling water just before use. Ragged holes appear along leaf edges. Cause – Slugs or snails. Solution – Outdoor plants become easy targets for the pests. Copper tape fastened to the table or stand upon which the orchids are kept will deter slugs and snails. Slugs and snails are deterred by copper barriers. 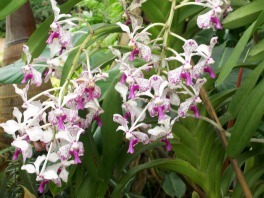 It is important to provide the best conditions possible for the type of orchid you are growing. Before purchasing an orchid plant, make sure you are capable of providing the conditions necessary for the orchid to flourish. Consider contacting a local orchid grower for tips and advice on how to select the best orchid for the conditions you can provide. Causes - The temperature is not within the proper range; too much fertilizer; not enough light. Solutions - Be sure to choose orchids that suit the growing conditions that you can provide. Reduce the amount of fertilizer. Orchid leaf tips turn brown. Cause – Applying too much fertilizer can cause fertilizer burn; improper watering schedule. Solution – Dilute the plant food to ¼ of the amount recommended on the label. Be sure you are adhering to the watering requirements of the orchid species you have chosen. Leaves turn an unusually light green color. Cause – Plant is receiving too much sun. Solution – Move orchid to a location that receives more shade.